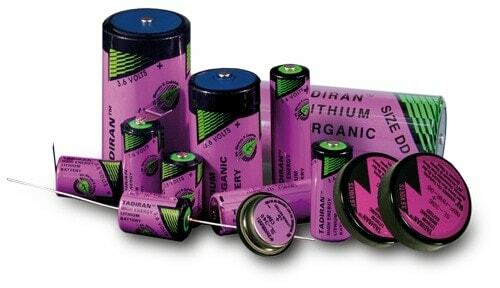 Tadiran Batteries have been a major force in the development of Lithium Thionyl Chloride batteries for over 30 years. They have manufacturing plants in Germany and Israel. They are now able to demonstrate real live data that show that when correctly designed they can achieve design in life of 25 years plus. The company was originally two separate entities, Sonnenschein Lithium who typically looked after Europe and Tadiran Batteries who looked after the rest of the world. This is why you can often find two specific part numbering systems. In Europe you tend to find the prefix SL (Sonnenschein Lithum) and in the rest of the world, you find the prefix TL. To confuse the issue a little further, there are a number of different ranges that are designed to specific requirements. I have tried to summarise them below – Specifically for the European range. I will add the rest of the world at a later date. SL-300 Series – Standard use and stand-by use, typically low current drain memory back up application. This range has excellent shelf life (10 years), Extremely low self-discharge (1 % or less per year), Suited for long-term use with low current. For operation at low current levels with long stands, intermittent discharge with medium current level provided the average is not below the active current level. Temperature range from -55 °C to +85 °C. SL-500 Series – Extended temperature range. Is similar to the 3 series but with an extension of temperature range up to +130 °C. This has the compromise effect of a lower capacity. SL-700 Series – Enhanced start applications. This has the Major improvement of voltage delay at the start of discharge at medium current levels (TMV), intermittent discharge at medium current levels, but note that the best results are found if used after no more than 3 years of storage, other the performance is like the SL-300 series. SL-2700 Series (iXtra) – Fast voltage recovery after long term storage and/or use. They exhibit a higher voltage under pulse load even with low background currents. They have improved voltage delay behaviour at ambient and elevated temperatures. More capacity, Higher discharge rate and no orientation effect, that means performance is the same anyway up. SL-800/2800 Series (XOL) – eXtended Operation Life. More capacity, Extra low self discharge. Extra low passivation during long term use.